The SMB100 is our surface mount box for mounting your SAC on a wall without cutting a big hole for the box. This rough-in box is designed to be easily mounted onto any fascia and provide a sealed surface for you SAC. This sealed box is 1.5" thick and powder coated with a flat back finish that looks nice with any finish SAC. The SMB100 has a large back surface area that is easy to seal to most any fascia. This surface mount box has no ugly seam. The SMB100 is sealed to keep out moisture and dust. The box mounts easily and securely with enough room for the camera, intercom and keypad. Works with SAC50, 100 or 200. Built with a thick durable metal. 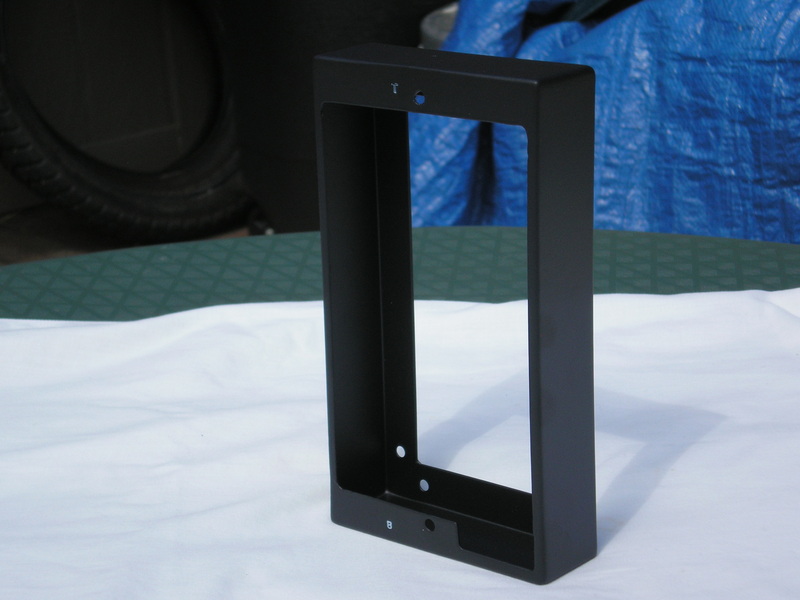 Powder coated steel will not rust. Has tabs to easily mount your SAC to. This box is sealed to keep the dust and moisture out. Dimensions 4.375"W x 7.875H x 1.5"D.
007 Systems makes this product and is warrantied to have no defects and work as described for 2 years. Damaging the powder coating will void the warranty.